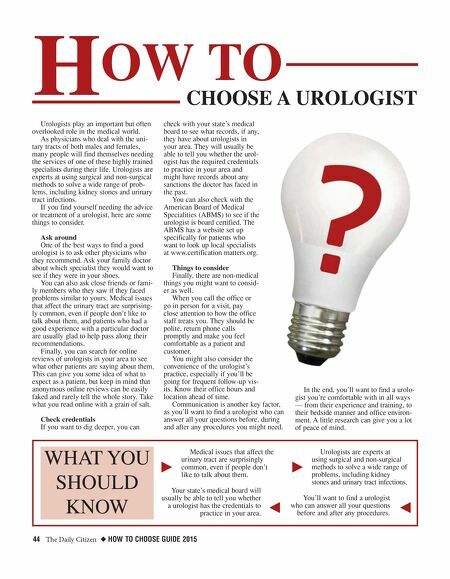 44 The Daily Citizen ◆ HOW TO CHOOSE GUIDE 2015 Urologists play an important but often overlooked role in the medical world. As physicians who deal with the uni- tary tracts of both males and females, many people will find themselves needing the services of one of these highly trained specialists during their life. Urologists are experts at using surgical and non-surgical methods to solve a wide range of prob- lems, including kidney stones and urinary tract infections. If you find yourself needing the advice or treatment of a urologist, here are some things to consider. Ask around One of the best ways to find a good urologist is to ask other physicians who they recommend. Ask your family doctor about which specialist they would want to see if they were in your shoes. You can also ask close friends or fami- ly members who they saw if they faced problems similar to yours. Medical issues that affect the urinary tract are surprising- ly common, even if people don't like to talk about them, and patients who had a good experience with a particular doctor are usually glad to help pass along their recommendations. Finally, you can search for online reviews of urologists in your area to see what other patients are saying about them. This can give you some idea of what to expect as a patient, but keep in mind that anonymous online reviews can be easily faked and rarely tell the whole story. Take what you read online with a grain of salt. Check credentials If you want to dig deeper, you can check with your state's medical board to see what records, if any, they have about urologists in your area. They will usually be able to tell you whether the urol- ogist has the required credentials to practice in your area and might have records about any sanctions the doctor has faced in the past. You can also check with the American Board of Medical Specialities (ABMS) to see if the urologist is board certified. The ABMS has a website set up specifically for patients who want to look up local specialists at www.certification matters.org. Things to consider Finally, there are non-medical things you might want to consid- er as well. When you call the office or go in person for a visit, pay close attention to how the office staff treats you. They should be polite, return phone calls promptly and make you feel comfortable as a patient and customer. You might also consider the convenience of the urologist's practice, especially if you'll be going for frequent follow-up vis- its. Know their office hours and location ahead of time. Communication is another key factor, as you'll want to find a urologist who can answer all your questions before, during and after any procedures you might need. In the end, you'll want to find a urolo- gist you're comfortable with in all ways — from their experience and training, to their bedside manner and office environ- ment. A little research can give you a lot of peace of mind. H OW TO CHOOSE A UROLOGIST WHAT YOU SHOULD KNOW k j Medical issues that affect the urinary tract are surprisingly common, even if people don't like to talk about them. Your state's medical board will usually be able to tell you whether a urologist has the credentials to practice in your area. k j Urologists are experts at using surgical and non-surgical methods to solve a wide range of problems, including kidney stones and urinary tract infections. You'll want to find a urologist who can answer all your questions before and after any procedures.